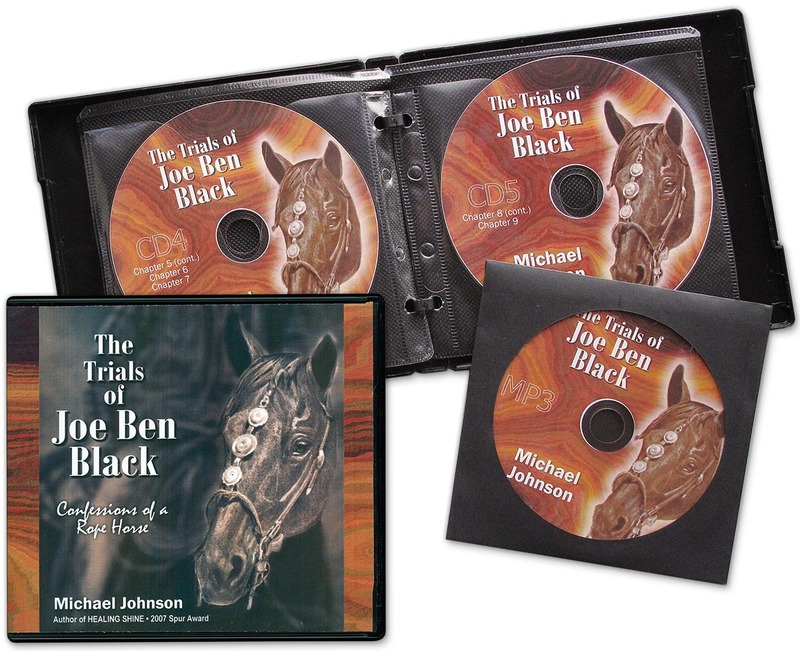 The Trials of Joe Ben Black - Confessions of a Rope Horse AUDIO CD Set includes 8 audio CDs and an MP3 disc. A sequel to the highly popular Healing Shine - A Spiritual Assignment, The Trials of Joe Ben Black - Confessions of a Rope Horse was intended to be a collection of best practices to start a young roping horse. However, the subject matter turned out to encompass a much larger area. What is the best way to train our horse? According to Michael Johnson's latest book "The process is far less about training the horse... and far more about training ourselves." Within the pages of Joe Ben Black you will find a collection of best practices to start a young horse... with a twist. A good portion of the book is told from Joe Ben's point of view and from the stars of Healing Shine - the Shine Man and the hilarious Little Blue. Joe Ben's story begins with Michael by Joe Ben's mother's side the night of his birth, and chronicles the young horse's adventures en route to becoming a skilled roping horse five years later. The book is replete with Michael's honest appraisal of his mistakes along the way - the same ones we all make. An excellent read for the novice and seasoned horseman alike, there's wonderful humor throughout with stories of hope and clear strategies to improve your horsemanship skills. "So, does the horse come on earth knowing how to be a roping horse? Not exactly. I know however, he comes on the earth hard-wired to help man. Like the spider knows how to spin a web, and geese and hummingbirds know where to fly, the horse is instructed to help man. His purpose is encoded when he arrives. Whatever task we present to him, he watches, he listens, and he learns. Once he becomes aware of what we want, he will do it for us - whatever the task might be. If we give the horse sufficient time, he will do anything we ask. He will launch himself onto spears of the enemy in battle and die for us. He will run alongside a buffalo for us and he will spin for us so we can shoot our enemies from all directions. He will even help us rope cattle. The key is we have to ask him the right way. If we do that, we learn something extraordinary, something almost unbelievable, and something life-changing. And that is, the horse is a cosmic Swiss Army knife made by something grander than we can imagine. Once that awareness comes, the horse knows we know what he is... and he will respond."